by turning it into something completely different. · Roughly 700% more user engagement across all metrics: sessions-per-user, time-per-visit, posts-per-user, pages-per-visit, followers-per-blog, etc. · By the end of the month, on average, every user posted something every week. · From 800,000 monthly active users to 1 million weekly active users. · First positive month in over 3 years. Complete design and launch of a social blogging platform. Joel Marsh, a community manager, a moderator, and 6 developers. Strategy and total re-design of brand, UX, and UI. One of the lesser-known personas on Piczo was twenty-something men from India, who were just as passionate about fashion as our target users, and had the selfies to prove it. This project happened in parallel with the Stardoll case during 2009. Piczo was originally a website building community like Geocities, or perhaps MySpace, and in 2007 it was a pretty big deal: it reached 14 million active users (and 30 million registered accounts). Then Facebook was opened to the general public, and Piczo went from 14 million to 4 million users in a few months. After slowly dying for the next 3 years, Piczo was acquired by Stardoll. It was given to us with 800,000 half-interested users and no rules. Since Stardoll was a social fashion game that was popular among girls from 10-15 years old, we decided to turn Piczo into a platform for girls from 16-20, and at that time, nothing was hotter among young women than fashion blogging. So when you lost interest in pretend fashion on Stardoll, you could get into real fashion on Piczo. Fom the day we re-launched Piczo until a month later, we doubled our engagement metrics every week: roughly 700% improvement in a month. Doing that on any social site would be noteworthy, but doing it on a site that had been a zombie for three years was something special. There were a few key strategies that worked particularly well for the Piczo re-launch, explained below. We were only able to work on Piczo for a month after it re-launched, but that month was inspiring. After that, the business team managed it, until it was acquired two years later, and shut down. We were building a content site, and we didn’t have time for users to slowly learn the value of fashion blogging. When Piczo launched, you could make one good post and have 2,000 readers by the next day, and none of it was automated or fake. Social network design is complex, but when it's a content platform, content needs to be easy to make and easy to distribute. No exceptions. On the New Piczo, posting to your blog was very quick. If you were someone with original content to post, the blog posts were little templates, so a few clicks and a photo was all you needed to make a nice looking post that could be shared. If you were more of a collector type, you could easily create a great curated blog by re-posting (or “re-blogging”) other people’s posts. Tumblr and Twitter had only introduced their re-blog and retweet features within the previous two years (so this was more innovative than it might sound now! ), and since our entire user base was posting about the same topic, Piczo’s content was much more re-bloggable than most. Combined with following, likes, feeds, and featured blogs, Piczo was surprisingly good at making things “go viral” within the site, even on the first day. It never felt empty and never required other social networks to make it grow. and be loud about it. To us, the old Piczo was dead. We were not just trying to bring users back. This was something new. The new Piczo had nothing in common with the old site or old features, the new target audience was much more focused, and we had no time (or desire) to be gentle with users that had abandoned Piczo three years ago. Brand-wise, this was a hostile take-over. We changed everything except the logo. The new Piczo was creative, bold, and feminine. Black and pink, full of blatantly fashion-oriented user photos, hand-drawn elements, and stark Helvetica typography. It was rebellious. We highlighted users that had something to say, our copywriting was positive and independent, and we managed the community in a way that was inclusive and outspoken, rather than corporate and censored. It worked. But more importantly, it drew a line between who Piczo was for, and who it wasn’t. In social media, the common reaction was something like “I just logged into Piczo for the first time in years” or “WTF happened to Piczo? I like it!" The new brand spoke directly to our new, young, stylish, female audience. But it was just as important that the new brand spoke clearly to everyone else: love it or hate it, there’s a new Piczo in town. Love the haters the most. Although the majority of people reacted positively to the New Piczo, a few people hated it. Passionately. And when those people were good at writing comments and posts, it was an issue. Most companies would be tempted to ignore, or even ban those users, but we didn’t. The reason is simple and psychological: it's hard to hate the site that just made you famous. Without exception, every time we featured someone who was negative about the new Piczo —but good at blogging— they became positive about the new Piczo. Then their skill with comments and posts became an asset to the community. Loving the haters is actually a beautiful thing, and another reason that “being a kingmaker” was an important strategy. When a strong negative voice became a strong positive voice, the vibe in the community was amazing. Or in this case, a queenmaker. Kingmaker; A person who brings leaders to power through the exercise of political influence. If you try to censor a social network, the community feeling will die. But we also wanted Piczo to be about fashion, even though users could post about anything. So rather than censoring Piczo, we decided to reward the users that were the best examples of what we wanted. 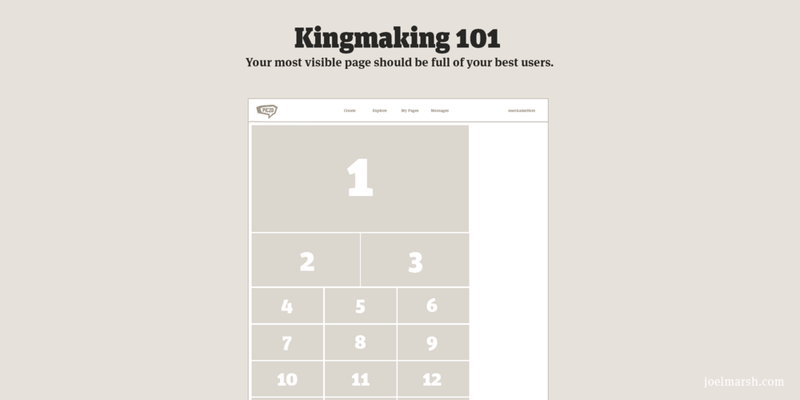 We designed the home page like a visual Top-10 list. If you were creative or stylish, you’d be featured, and being on the front page made you famous in a matter of hours. It worked very well. Within days Piczo was almost entirely fashion-related posts. Don’t automate the special stuff. One of the best things we did was to have a Community Manager that hand-picked every featured user, all the time. It made the whole thing feel very genuine. The only criteria for being featured was that you were a real, creative, fashion-forward person, putting yourself out there. Like the Community Manager. Once everybody understood that we were really looking at their blogs, and anybody could be discovered, and we actually knew what fashion looked like, engagement numbers started to move. When most companies have young users, they treat them like idiots. It’s sad, but true. But from the very beginning, we decided that Piczo was going to be a platform where you could be a real fashion blogger, not just “blogging for kids”. Every Piczo account got access to some basic analytics (more than what Tumblr offers now!) and automated feedback, based on their blog’s performance. In other words, every Piczo user got a blogging coach. Depending on the user’s performance, it told them how to make good posts, how often to post, how fast their audience was growing, things to try, how they compared to the community, and so on. And it was always encouraging. It also meant they didn’t have to deal with any code, or paid tools, or anything like that. Just the right amount of feedback for amateur, but serious, fashion bloggers.